What are you doing on October 2nd? Would you like to be my guest at a special Toronto event? I have one ticket to give away to Ai Weiwei: Voices of Freedom. It is a multi-media event to honour activist artist Ai Weiwei and pay tribute to his ‘relentless pursuit of free expression through art, social media and political protest’. The evening is organized by the Canadian Journalists for Free Expression (CJFE) and the Art Gallery of Ontario (AGO) and it is taking place at the AGO in Toronto. In my 5-minute time-slot, I’ll be speaking about the Four Warnings Signs that Free Expression is at Risk in Canada. I have some personal experience in that area. Funny thing is — before the Canadian government’s interference in my art show in 2011, I didn’t worry at all about free expression. I took it for granted, because I live in a free country, Canada. And I believed that our right to free expression was firmly protected. So, I’ll be talking about how Canadian’s right to free expression is being quietly eroded, what the warning signs are, and what we can do to protect it. UPDATE OCTOBER 7th: See Franke’s AGO slide presentation: Four Warnings Signs that Free Expression is at Risk in Canada. The Art Gallery of Ontario (AGO) joins forces with Canadian Journalists for Free Expression (CJFE) to present a multi-media event honouring dissident artist Ai Weiwei and paying tribute to his relentless pursuit of free expression through art, social media and political protest. Hosted by Anna Maria Tremonti, of CBC-Radio’s The Current, the evening will feature a lineup of prominent Canadian writers, poets, musicians, visual artists and performers, demonstrating with words, music and imagery the vital role creativity plays as a catalyst for social change and individual freedom. Franke James is a Canadian multi-media artist, author and activist who has drawn inspiration from the Canadian government’s attempts to silence her dissenting voice. James recently published her third illustrated book, Banned on the Hill: A True Story about Dirty Oil and Government Censorship. 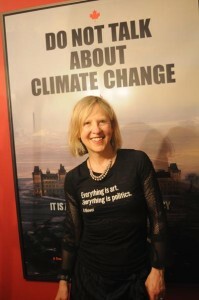 It was launched with a crowd-funding campaign that put her “Do Not Talk about Climate Change” posters on the streets of Ottawa. Despite the government’s interference, she has been a vocal critic, and a strong advocate for environmental and social justice. Her story “What is Harper afraid of?” motivated over 7,956 people to write to Ottawa. I’ll be drawing the winner using a random generator at 5pm on September 24th. I’ll also give the winner a signed copy of my new book, Banned on the Hill: A True Story about Dirty Oil and Government Censorship. 1) The winner is responsible for paying his/her own way to the event in Toronto at the Art Gallery of Ontario 317 Dundas St West. 2) Within two hours of notification, you have to let me know if you can accept the ticket. (We can’t dawdle because the AGO needs to know your name on September 25th.) Sadly, if I don’t hear from you within two hours of tweeting the winner, I’ll have to select another winner. 3) Quebec residents are not eligible due to their contest laws. Franke’s AGO slide presentation: Four Warnings Signs that Free Expression is at Risk in Canada. Congratulations on such a wonderful opportunity with Ai Weiwei. Got my fingers crossed.